OK. So we're going with Oaked IPA in the title of this beer listing so that it sits nicely within the page. But, according to the man behind it, it's technically an "Oak-aged-American-Belgo-Double-India-Pale-Ale". Breaking that down into its various parts, brewer Craig Eulenstein (pictured with an Oakey Dokey) tells us the beer features seven different malts, including Abbey malt and Belgian biscuit malt as well as a small portion of rye and smoke malt, that it was fermented with a Belgian ale yeast on oak chips, then dry hopped with fragrant US hops Mosaic, Citra and Centennial. "I've enjoyed toying around with some Belgian ales in the past," he says, "and picked up a few pointers from Charlie Hodgson from Mash in regards to ferment scheduling, so we brewed it up for GABS 2015 and decided we should enter it into AIBA." It went on to pick up a gold at the beer awards, meaning Craig was rather happy they'd kept some back at the brewery. A shout out to Cameron Stewart too. 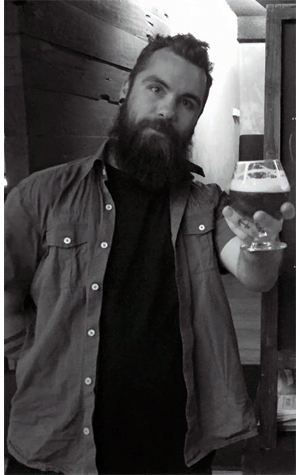 After winning the Western Australian State Amateur Brewers Competition, he got to brew his winning beer with The Monk. The Belgian Rye Saison was also entered into the AIBAs in May and picked up a gold medal too.